If you would think upon the function of love scientifically, think of it as a reversal transference–a point of function where two complementary forces, in the presence of a third stabilizing factor, exchange modes and one becomes the other. This is primary magnetism and compression. It is an ongoing function among all primary particles and energies. In organic life, DNA is constructed to conduct this complex and mysterious function. This is also the mystery of paradox which precedes, supersedes, exceeds, and reconciles all patterns of structure into simple fluidity. This primal power of love has within it a function of ‘self awareness,’ ‘self acknowledgment,’ and ‘self dialogue.’ This is true regardless of whether you are referring to love as beingness or as energy. You might call it the ‘I AM’ force. Through internalized communion, the whole becomes aware of its variable possibilities. Differences of potential are established and activation of them begins. Simultaneously, there is a holding and a releasing action that isolates the presence of a constant center existing neutrally toward the activating variables. This field can be seen to functionally operate as the “zero point” for compressing and expanding energy. The outer perimeter of a whole can never be determined for there is no point at which one element does not connect with yet another. A whole is designated by its character and quality–not by its boundaries! Its center, however, can be marked by ‘0.’ The forces expanding from that point exponentially multiply the energy released. Simultaneously, through the aspect of energetic tension, energy is transferred from one extreme of expansion to another. By these reversals, torque is generated, and that sets in motion a magnetic spin, or vortex. At the point of perfect stasis between the implicit and the explicit, there is a condition of hypersynchronicity, where matter, energy, space and time move into a ‘no- resistance’ mode of infinite potential. This is not the collapsing of matter. This is the synchronizing of it to a ‘zero point’ of perfect equilibrium. Perfect stasis is perfect equilibrium: the Holy Now, from which everything takes shape. But this is not static in the sense of being inert or lifeless. It is full of interchange brought into existence by various parts of the whole recognizing and responding to each other. The void was a magnetic vortex created within the One Spirit, through which the adamantine particles were called into assembly. The adamantine particles are the living body of God. They are the only particles that can compress into density and also expand into infinity. They equally belong to both the dimensions of density and to the realm of unlimited potential. Because they were called into assembly and compressed, categories and sub-categories of elements were created. The first and primary compression of adamantine particles resulted in the creation of light.That, however, was first light. It is visible to the conscious soul and is present always on the higher dimensions of what is often called Heaven. This light is a long way from the compression necessary to produce the photons of sunlight. What you receive from the sun is a complex result of many levels of compression. With the great explosion, which reversed compression, came the release of photons, which are second density light. “Before the great explosion, all matter and energy were in first density compression and there was only continuous light. From that explosion came an unbridled force of expanding particles, which manifested the phenomena of energy and space, as you know it. And so there could be designations of difference among elements. Thus, at that point, there was night and day. Therefore, the second day was complete. “After the great explosion, compression continued and that eventually resulted in the creation of suns. Before the creation of suns could occur, the third act of creation had to be accomplished, which was the separation of the waters, the establishment of ground, and the production of vegetation.”the separation of the waters was in reference to the expansion of magnetic fields and activation of separate vortexes. “The third act of creation was the multiplication of magnetic vortexes (also called attractor fields). The first principle of creation is love. You are love. As love, you have the power to attract to yourself everything you need. As love, you have the power to ignite into compression every form of energy and every of supply that your life requires. Everything is simultaneous. Compression, in its purest form, is simultaneity. The Holy Source compresses all time, all space, all energy, and all manifestation. Pure and perfect simultaneity of presence, awareness, and manifestation is the unique and omnipotent power of God. This is the ultimate state of compression. This is where it all began. 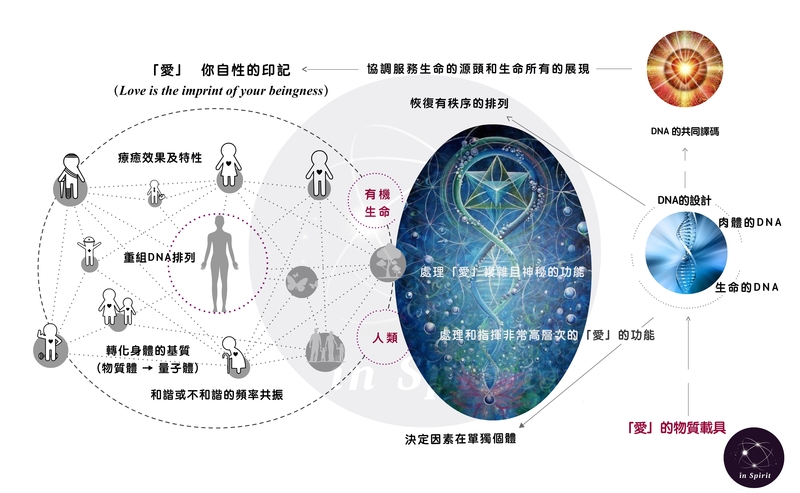 It began with the “zero point," the point of perfect equilibrium where everything exists in unison, in simultaneous communication and simultaneous understanding.